The Gantt chart is considered as a productive project management tool in many industries. Check out all the essential points of Gantt charts in this detailed article to learn about the concept with useful real-time examples. Why Call It a "Gantt Chart"? To be simple, a Gantt chart is a kind of colored-bar visual presentation of a series of breakdown scheduled tasks over a certain period. The horizontal axis represents the total time span and task sequence based on daily, weekly or monthly frequency, while the vertical axis shows the specific tasks that need to be completed. Project managers use such charts to update and monitor resources and team members along the way to achieve the final goal. You can click on the chart below to see more details. 1. Task names - it directly shows you what a task is about, for example, digital design or software development etc. 2. Task bars - this element indicates information like task start and finish date, task duration, and task progress in percentages. For task progress two different colors are used to differ the completed part and the unfinished part. 3. Task relationships - this normally cover task priority and task dependencies, for example, in how much degree that one activity overlaps the other, or the sequence of doing tasks; Generally, task dependencies can be set based on start-to-finish, start-to-start, finish-to-finish, and finish-to-start. The finish-to-start dependency means task B can't start until task A has finished. 4. Milestones - it is often shown in a tiny diamond-shaped icon in your Gantt chart as an important deliverable to remark major step. 5. Resource management - it is basically about who should do what by using what types of materials etc. In the project below, Gwen and Dylan are assigned to do the promotion jobs start on 14th Aug 2018. 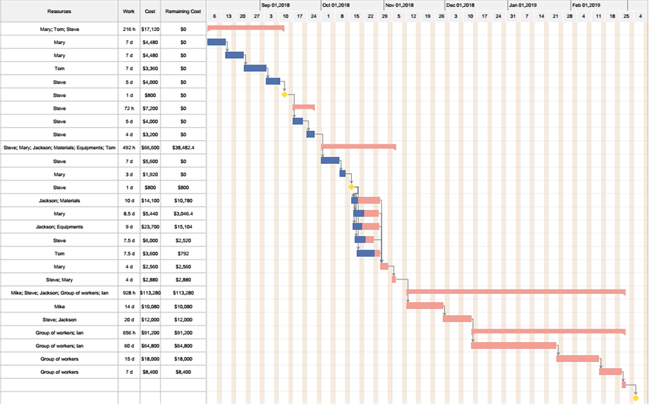 Compared to many other project management tactics, Gantt chart is a more ancient invention. Actually, the idea of Gantt chart was first pointed out by a Polish engineer Karol Adamiecki in 1896, who came up with the idea of showing steps visually to easily see his steel production plans. The result was spectacular since Karol had finally four times of the original steel production amount. Karol named his chart as Harmonogram, which can be considered as a precursor to the modern Gantt chart. Around 14 years later, Henry Gantt, a business consultant, developed Karol's idea in a more visual way and firstly published the Gantt chart theory in English-speaking western countries. Nevertheless, nature and charting process of Gantt charts stay largely the same as to help project supervisors to check work schedule and progress. Quick to Accommodate "Big and Small Pictures"
Different roles may have a different need in terms of knowing about what's going on with a specific project. The "big picture" would help people who have not experienced project members, like stakeholders or other external sponsors, to quickly go through the overall percentage of completion, or the process of a specific task. In contrast, the "small picture" view is for members within the project team who need a more detailed check of their project. The task assignment, task relationships and project progress are clear enough for team leaders to monitor work and force slacking members to speed up. 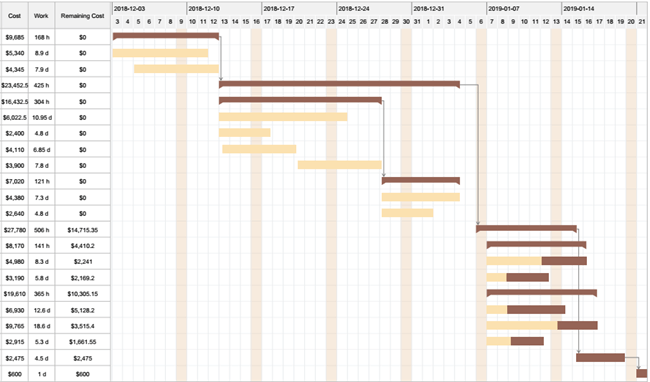 Moreover, milestones in Gantt charts can be served as a motivational tool. 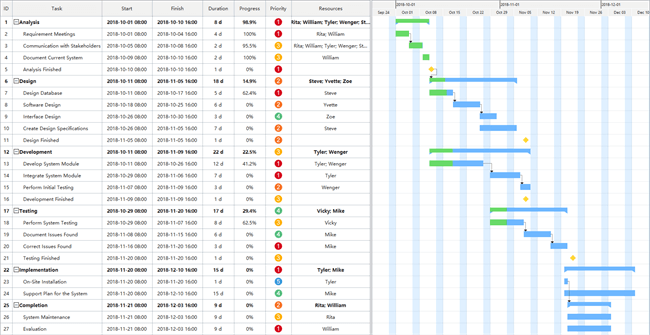 Gantt charts work great for solving juggle resources across several different projects. Besides, for tasks that have simultaneous duration, you as the project manager can easily track and spot overworked or underutilized tasks by using Gantt charts. Estimating a project seems to be a big challenge to project managers. In Gantt charts, however, team leaders can estimate based on the rich existing data and resources. So now you may wonder about the disadvantages of using Gantt charts? Feel free to read this advantages and disadvantages of Gantt chart article for the answer. Tasks in most of the manufacturing project, for example, residential construction plans or car production project, are interdependent and highly process-oriented so the task dependencies feature in Gantt charts help a lot for such cases. The Gantt chart example here shows you the typical process of an interior design project with detailed cost and members assignment. Gantt charts can also be used for online sectors, such as setting up new websites, development software or applications and so on. Again all of these tasks are interdependent so your team may need to follow a clear sequence from creating the user interface wireframe to test website. 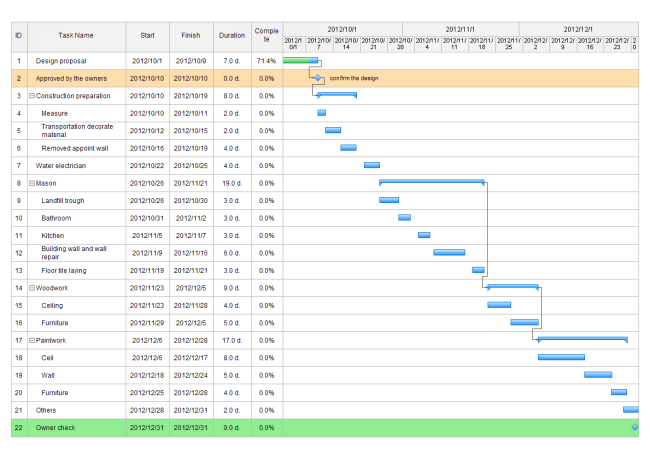 Check out more insights into the below Gantt chart example for task duration, task priority and milestones etc. Actually, Gantt charts can even be used in business strategy fields like marketing campaigns, consulting programs, report writing, event planning and more. For instance, the Gantt chart example here shows you how to set up the business analysis of a new market. How to Create a Gantt Chart Conveniently? In early times, Gantt charts are all drawn on paper by hands. Nowadays, however, paperless project management software with advanced Gantt chart functions to speed up the overall work productivity. Feel free to quickly add new tasks, set data formats and units, name tasks, build task dependencies, manage resources and generate reports etc. For more functions, please click on the free download button at the bottom of this page to have a try now.